Andrews McMeel Publishing, 9781449408657, 152pp. A hilarious collection of over 100 four color cat cartoons including cutting edge design and snarky commentary about the joined lives of cats and humans. 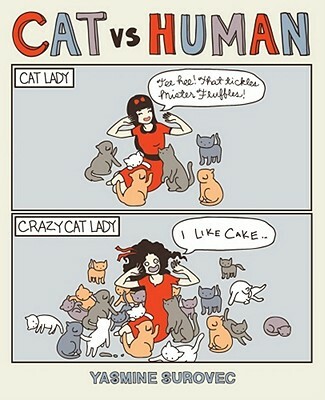 The hugely successful blog catvshuman.com receives over 6,000 page views per day, and many of its cartoons have gone viral. 40% new material unpublished on the website. Yasmine Surovec began sketching her clever and sarcastic Cat Versus Human cartoons as a way to relax and unwind. Soon, her popular blog at catversushuman.blogspot.com began receiving as many as 12,000 hits per day, with a number of posts going viral and appearing on popular Web sites such as The Huffington Post and I Can Has Cheezburger. Now, a selection of 100 Cat Versus Human strips--many never previously published--can be found inside this inaugural collection of Cat Versus Human. Proud owners of Felis domesticus will instantly recognize Surovec's keen insights into cat behavior and all of the characteristic intricacies of the cat-human relationship, such as the allure of an empty cardboard box trumping an expensive battery-operated toy or how a cat's favorite nap spot might as easily be inside a litter box, on top of clean laundry, or directly on top of a human face. Cat Versus Human also encourages an affectionate look at your once-was-in-mint-condition midcentury modern sofa that is now being unstuffed one cat claw at a time. In addition to being the creative talent behind catversushuman.blogspot.com, Yasmine Surovec is an illustrator and designer behind a number of popular online ventures. Her work has been featured on popular sites such as Apartment Therapy, Craft Magazine, Decor8, I Can Has Cheezburger, and more. She lives in Phoenix, AZ, with her husband, three cats, and puppy.